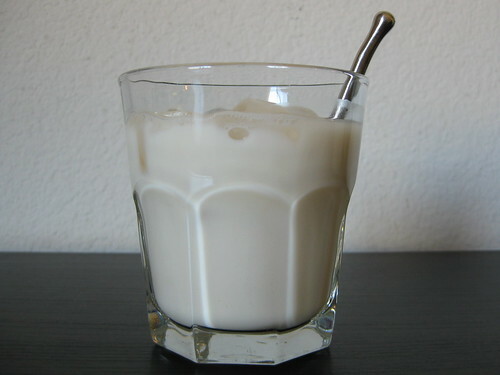 With Cinco de Mayo just a few days away, on a weekday no less, I thought it appropriate to share one of my favorite non-alcoholic (unless you count the vanilla extract) beverage options for the occassion — horchata. I was first introduced to this drink at a local taqueria, Henry’s, while I was in college. Admittedly, the first sip was a bit of a shock, it was unlike anything I had tasted before. However, before I finished that first glass, I was hooked on the refreshing, creamy, sweet, and lightly spiced concoction. Years passed before I tried to make horchata from scratch—the powdered, just-add-water versions and cartons of the stuff at the grocery store just didn’t cut it. It can be a bit of a messy process (with all the transferring of liquid from one container to another, and all), but it is otherwise an easy recipe to throw together for your next fiesta. Plus, there’s even an excellent theme song available, what more could you ask for? In a blender, combine 1 cup of the rice with 2 cups of water and the cinnamon stick (or ground cinnamon). Blend for 1-2 minutes. Transfer ground rice and water mixture to a large bowl. Repeat blending process with the remaining 2 cups rice and 4 cups of the water. Stir in the remaining 6 cups water. Cover container and place in the fridge to steep for at least 12 hours (stir mixture every few hours, if possible). After the mixture has steeped, give it one last stir. Using a fine mesh sieve lined with several layers of cheesecloth, strain mixture into a clean bowl. Discard rice from the cheesecloth as needed—it may also be rinsed out and wrung dry throughout the straining process. Whisk sweetened condensed milk and vanilla extract into the strained liquid. Add enough water to yield 12 cups of horchata. Shake or stir well before serving in glasses over lots of ice. Can be kept refrigerated in a covered container up to 7 days.